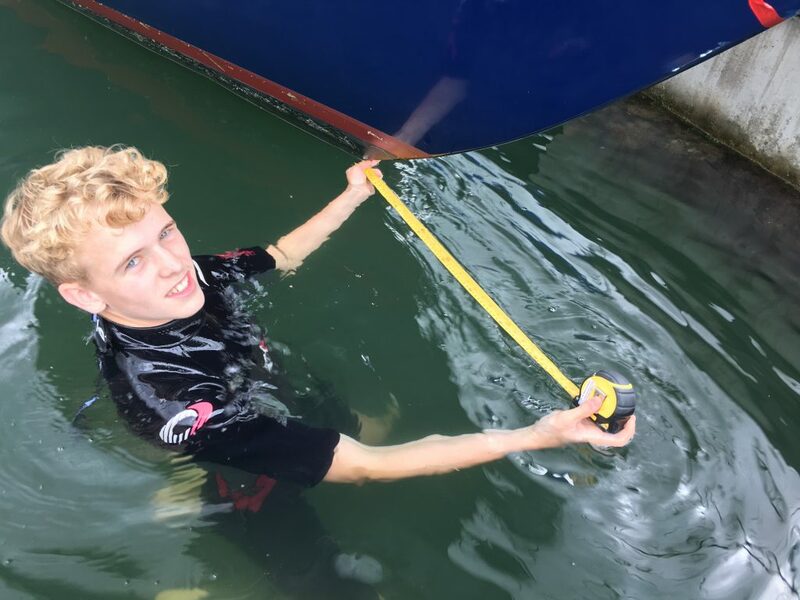 ‘Windchat’ is going to be entered in some offshore races with the Junior Offshore Group in the coming years and and as this requires an IRC Rating we needed to carry out a number of measurements. Quite a lot actually. These are more extensive than had been taken for entry in the 2016 Round the Island Race and going forward Windchat will be in an IRC class rather than the less official ISCRS classes. The most tricky were the Bow Overhang and Stern Overhang which necessitated someone getting into the water. My son, Joe, agreed in exchange for a stop via Five Guys in Whitehill. 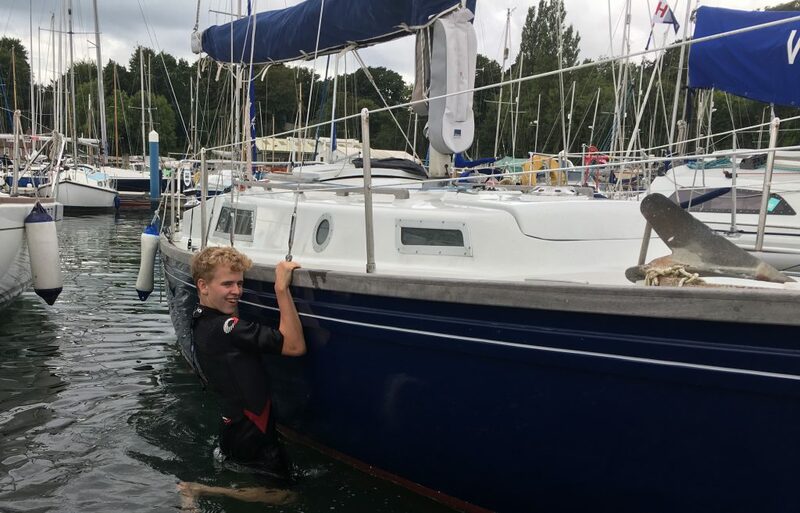 The dimensions of the hull comprise the usual length and beam but also they want to know by how much the stern overhangs the waterline (SO) and likewise for the bow (BO). Actually, they also want to know by how far the forefoot 45° point overhangs the waterline (x). We marked this with some tape using a spirit level with a 45° bubble. It was very important to use a plumb line to hang from the various points to the water so that the measurements were accurate. Diagram showing the main measurements needed for the IRC bow and stern overhangs. The IRC Rating system also needs hull data such as weight and displacement but these can be taken from manufacturer’s data if the certificate doesn’t need to be endorsed. We also needed to measure the lenght of mainsail hoist, outhaul, forestay hoist etc. Hopefully these measurements will be useful to anyone else applying for an IRC Rating Certificate for their Cutlass 27. 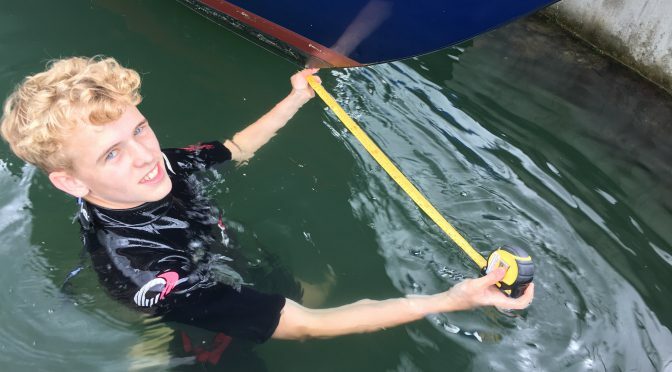 Incidentally, the length of waterline (LWL) is not specifically called out for but can be calculated by LH-SO-BO as 6.47m – giving a maximum hull speed of 6.2 knots.